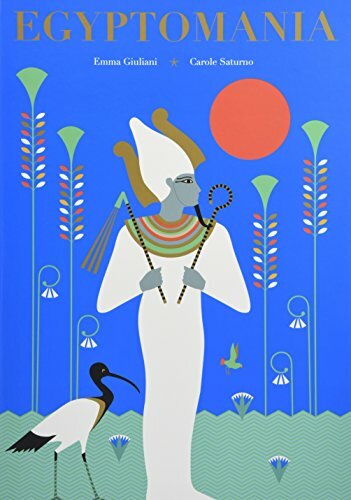 With its gorgeous turquoise background embellished with beautiful Egyptian motifs, Egyptomania’s cover makes it a pick-me-up-and-buy-me book. The content doesn’t disappoint. The fascinating information about the daily life—and death—of the Ancient Egyptians literally unfolds. Each spread includes flaps and folds that when lifted or pulled down reveal additional details. For example, on the pages explaining the River Nile’s three seasons, inset pages describe the river when it’s in flood, the crop sowing time, and harvest time. On the same spread, the rear end of a hippo lifts to reveal text about Hapi, the god who was neither man nor woman who represented the Nile floods. On the facing page, another flap opens to reveal the layers of the first pyramid, built at Saqqara in 2700 BC. The pharaoh Djoser wanted a fancier tomb than the simple mastaba, so he asked his architect, Imhotep, to design and build a more impressive structure. Each plan Imhotep presented was not big or tall enough to satisfy Djoser. “The final result was a stepped pyramid, built like a staircase to the sky to reach the gods.” It is 200 feet tall, six times higher than architect Imhotep originally planned. A complex, ingenious spread focuses on the temples and gods. The two facing pages open to create a four-page spread devoted to the most important Egyptian gods. Here there are doors, flaps, dropdowns, and an accordion fold that reveals the long body of Apep, the giant snake that tried to stop Ra, the sun god, from rising every morning. Also included in this remarkable spread are Amun, the king of the gods; Amun’s wife, Mut, who wore a double crown that symbolizes Upper and Lower Egypt; Hathor, who wore a necklace that was a magical musical instrument; Sekhmet, the destructive side of Hathor; Taweret, who had a hippopotamus body, lioness’s paws, crocodile tail, and the arms and breasts of a woman; and finally Apep, the giant snake that tried to stop Ra, the sun god, from rising every morning. Pull on the accordion fold, and Apep’s body extends to its full length. The section on embalming gives readers an inside look at what the dead body looks like under all the wrappings. An elaborately decorated sarcophagus opens to reveal the nested coffins inside, and on a side flap Saturno explain canoptic jars. Four spirits, represented on the lid of each jar, guarded the liver, intestines, lungs, and stomach of the deceased. The four jars, each with a different spirit head, are depicted on the flap, and each jar flips down to show the body part inside. It will require an accomplished young reader to take in the detailed information, including all the Egyptian names and terms (Pschent, maat, viziers, nomarchs, scribes) that Saturno freely uses. Having said that, she does an excellent job of explaining the meaning of the Egyptian words, and most “vocabulary” words are used in a context where the meaning should be clear. The physical aspects of the book also work to keep the reader engaged. The colors and illustrations, done in the Ancient Egyptian style, are compelling, and the interactive flaps add to the fun. Readers can skim the surface, reading just what’s on top, or delve deeper into the additional information hidden within the layers. However, except for the most precocious youngster, eleven- or twelve-year-olds through adults are more likely to fully appreciate this beautiful book than six- to nine-year-olds. Any book that has moving parts is fragile. The pages of Egyptomania are made of sturdy stock and the paper engineering is well done. Nevertheless, before giving this book to a child, it would be wise make sure he or she sees books as precious things to be treasured and handled gently and with care.